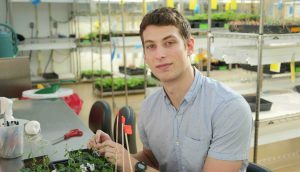 Graduate student Joe Jacobowitz analyzes new enzymes that could reveal key insights into plant reproduction. Every morning, fifth-year graduate student Joe Jacobowitz takes the elevator to the seventh floor of the Whitehead Institute, passes the soil bins, “false winter” fridges, and toasty growing chambers, and enters his favorite workspace: the greenhouse. There, among the myriad of tall, stout, grass-like, and blooming plants, he attends to his organism of choice, Arabidopsis thaliana. With four simple, white petals interrupted by protruding, yellow stamens, “it looks like something that would grow in the cracks of a sidewalk,” Jacobowitz says. 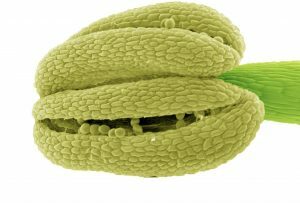 While you or I might pass by it and not think twice, Jacobowitz and the Weng lab hold that Arabidopsis could reveal key insights into pollen development, in particular which enzymes are critical for plant reproduction. Jacobowitz became fascinated by enzymes as a biochemistry major at Brandeis University, studying the evolution of a single enzyme found in the deadliest form of malaria. After arriving at MIT Biology for graduate school and joining Jing-Ke Weng’s team at the Whitehead, Jacobowitz shifted his focus from biochemistry and biophysics to plant development. His work investigating the pollen-bearing chamber known as the anther represents just one facet of the Weng lab — which probes the origin and evolution of plant metabolism, as well as the small molecules plants produce to interact with their environments. An Arabidopsis anther splits open to release its pollen grains. Above his lab desk, next to hand-drawn sketches and photos of friends, Jacobowitz has taped intricate microscopy images detailing the many complex stages of anther development. The pollen grains inside this structure contain the plant’s male gametes, which are transferred via wind and passersby to the female part, the pistil, of another flower. In the case of Arabidopsis, a single flower can self-pollinate and reproduce on its own, generating seeds and engendering the next generation. As the pollen grains mature, they become coated in a tough outer layer made of the material sporopollenin. This polymer, Jacobowitz explains, has helped sculpt the terrestrial ecosystem we know today. Nearly 500 million years ago, the first plants migrated from sea to land, and eventually developed this durable coating to protect their delicate pollen grains from the stresses of living above water, such as UV radiation and desiccation. 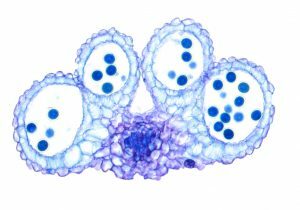 Today, researchers understand the basic sequence of events required for pollen development, but it’s been historically difficult to identify the genes involved — or even break down the resilient sporopollenin to determine its composition. In December of 2018, Weng lab postdoc Fu-Shuang Li and his team became the first to report the successful degradation of this virtually indestructible material and determine its chemical structure. Jacobowitz spent almost a year sifting through online databases to compile a list of enzymes that could potentially play a critical role in anther development. He ordered knockout lines that eliminated each enzyme one at a time, and watched as the plants matured. At first, nothing happened. Jacobowitz was simply rearing a bunch of normal plants. But then it occurred to him that perhaps nature had built in some redundancy, allowing plants to survive these genetic errors. If one enzyme was incapacitated, another might compensate for the loss and assume its function so development could proceed as usual. Cross section of a four-chambered Arabidopsis anther just before it opens, with the circular, mature pollen grains in dark blue. Post-MIT, Jacobowitz is considering pursing a postdoc in genetics. He’s open to studying any organism, so plants aren’t off the table just yet. “As humans, we rely heavily on plant-based medicines and agricultural products,” he says. “In today’s changing climate, it’s especially important recognize our dependence on plants, and put necessary resources into understanding the basic principles governing their reproductive cycle.” In fact, our own lives could depend on it.